Janesville Parker's Chelsea Naber rounds first and heads for second base on her way to a triple in the fourth inning of a Big Eight Conference game against Madison East on Tuesday, April 9, 2019. 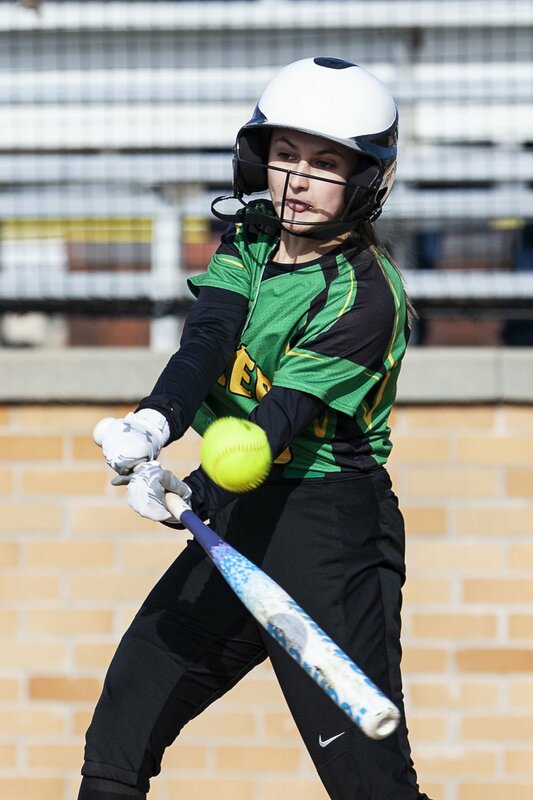 Janesville Parker’s Grace Williams connects for a hit during a Big Eight Conference game against Madison East on Tuesday, April 9, 2019. Janesville Parker’s Chelsea Naber winds up to pitch during a Big Eight Conference game against Madison East on Tuesday, April 9, 2019. The Janesville Parker softball team played its cleanest game of the spring Tuesday. That led to a mostly worry-free victory on a blustery afternoon at the Youth Sports Complex. Chelsea Naber threw her first shutout of the season, and the bottom of Parker’s batting order started a pair of big innings as the Vikings bested Madison East 8-0. The Vikings (3-4, 2-2 Big Eight) did not commit an error and totaled 10 hits as they ended a four-game losing streak. “We put the bat on the ball in a lot of good spots, we played sound defense and, of course, when your pitcher throws a shutout it helps a ton,” Parker coach Bob Getka said. Alexys Luek, Jasmyn Demrow, Alli Rosga and Grace Williams, Parker’s Nos. 6-9 hitters, combined for eight hits and six runs scored. Demrow finished 3-for-3 and scored twice. Luek doubled leading off the second and scored when her liner to center went under the glove of East’s center fielder. Demrow, Rosga and Williams each singled, allowing the Vikings to take a 3-0 lead. And Parker used a walk and three hits, including Demrow’s double, to add four more runs in the third. Naber scattered two hits while striking out seven and walking one. She lowered her season ERA to 2.38 and posted at least seven strikeouts for the third straight game. “Just speed on the fastballs, and switching it up sometimes with changeups,” Naber said of what was most effective against East. The senior right-hander worked out of a two-on, one-out jam in the top of the first, with an assist from catcher Luek, who threw out Kiannah Langham-Oliver trying to steal third. Including the final out of the first, Naber set down 18 straight hitters before walking Molly Najdowski with one gone in the top of the seventh. Ava Ehrlinger followed with a double, but Naber struck out Deniye Mitchell on four pitches and got Sabrina Thorson on a grounder to second to preserve her shutout. The Vikings did most of their damage against Madison East (0-4, 0-4 Big Eight) starter Isabella Gunter. Anna Sniadach struck out four and gave up an unearned run in three innings of relief. Parker got back in the win column after navigating a difficult three-game gantlet last week that included losses to Verona, Sun Prairie and Burlington. Parker is scheduled to travel to La Follette on Wednesday and host Middleton on Thursday, though both games could be wiped out by rain and snow over the next few days. Leading hitters—Luek (P) 2x3, Demrow (P) 3x3, Rosga (P) 2x3. 2B—Demrow, Luek. 3B—Naber. SO—Gunter 0, Sniadach 4, Naber 7. BB—Gunter 1, Sniadach 2, Naber 1.